Win a Double Pass !! Do we ever have truly unguarded moments anymore? When are we truly authentic? This May, Chunky Move presents the world premiere of LUCID, an intimate performance for a dancer, an actor and multiple cameras, which digs deeply into how we form, monitor and edit our own image in response to our heroes and icons, our imagined worlds and censored dreams. 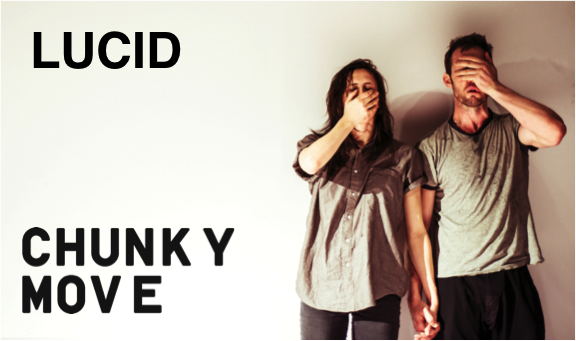 LUCID continues Chunky Move Artistic Director Anouk van Dijk’s study of the dynamics of contemporary human interaction. Joining forces with Composer Jethro Woodward, Set and Lighting Designer Ben Cobham (Bluebottle), Costume Designer Chloe Greaves and dramaturge Anny Mokotow, LUCID also reunites the sublimely physical performers Stephen Phillips and Lauren Langlois. In our hyper-conscious times, dreams are available in the palm of a hand, the flick of a thumb, and every gesture, every twitch in our face is critiqued and controlled; private experiences are more publically accessible than ever before. In LUCID, two performers travel to places where they can be all that they desire, fear or censor, shape shifting in and out of other people’s skins, searching for pieces of themselves in the reflection of another. In this new work, Anouk van Dijk continues to expand upon her energetic and emotionally charged physical language. LUCID contrasts chaos with clarity, fearless abandon with the compulsion to continuously manipulate how we are publically perceived. WIN TICKETS to see LUCID!! DanceLife has a double pass to give away to see LUCID on Wednesday 1st June at 7:30pm at Chunky Move Studios in Southbank, Melbourne. To enter, please send your name and phone number via email to win@dancelife.com.au. Entries close 25th May and winners will be drawn at random. Good luck! Previous Post Ireland's Liz Roche | WIN TIX!